The Flemish artist, Anthony van Dyck, painted this portrait of an Italian nobleman while he was working in Genoa between 1622 and 1625. 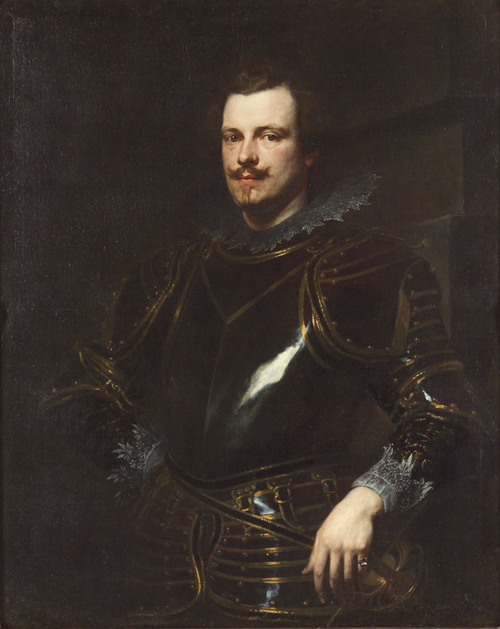 Supremely talented and precocious, van Dyck enjoyed considerable success in Italy, Flanders, and eventually England, where he was the favorite painter of King Charles I. He painted notable religious and mythological canvases, but remains most famous for his extraordinarily vivid portraits. The name of this sitter, with his graceful pose and penetrating glance, is unknown. He was certainly a wealthy Genoese patrician, however. To convey this to future viewers of his portrait, he donned his richest apparel for the occasion, including a finely crafted suit of armor and his most expensive wide lace collar and cuffs.